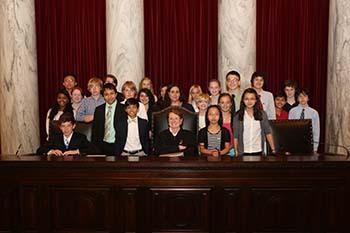 The Supreme Court’s civic education program for middle school and high school students allows participating classes to write their own scripts based on one of three criminal case scenarios in the West Virginia Law Adventure rules book, unlike other mock trial programs in which students act out scripts written by adults. The case scenarios are written by the Young Lawyers Section of the West Virginia State Bar, and the young lawyers judge winners in several grade categories. Each participating class must act out its script in front of a judicial officer – a magistrate, family court judge, or circuit judge – before sending in its entry. Winners in each category are invited to the Supreme Court Chamber at the State Capitol in Charleston to meet the Chief Justice and receive their awards.